Decentius Opsius is the Captain of the Leyawiin Coast Guard, although his duties seem to be mostly those of a tour-guide. Decentius will happily tell you the story of Torval the Pilot, if you're willing to hear it. After waking up early at 6am in the Coast Guard Station, he wanders around the place until 8am. If it's not raining, he sets off to patrol the area between the North Gate and the docks. At midday, he returns to the station to eat a two hour lunch before resuming his patrol duties; still assuming it isn't raining. Between 4pm to 8pm, he wanders around the station, before setting off for the Three Sisters' Inn for a two-hour supper. Once he gets back, he enjoys his free time until he goes to bed at midnight. Although most guards prefer light armor, he evidently prefers heavy armor. He wears steel boots, gauntlets, and greaves along with a Leyawiin cuirass. He is armed with a silver claymore and also carries a Coast Guard Station key, a set of random lower-class clothing, and a meager amount of gold. 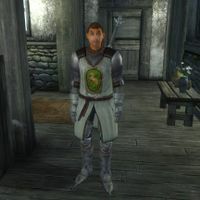 When asked about Leyawiin, Decentius will be eager to tell you the story of Torval the Pilot: "Well, stranger, anyone ever tell you the story of Torval the Pilot, the High Elf who discovered the Niben? The patron saint of Leyawiin?" You can push him away, telling him he already told you that story, which will cause him to say: "Oh. Sorry. The old memory is not what it used to be." You can also just tell him you are not interested: "Okay. Just being friendly..." If you show interest, he will tell you the whole story about Leyawiin's patron saint: "Have you seen the statue? It's in the southwest corner of the town. That's the High Elf explorer, Torval the Pilot. Back in the Merethic, he charted the sea lanes and explored the River Niben. Torval sailed all the way from Topal Bay up the Niben Valley. He purchased the Eight Islands... the site of White Gold Tower and the Imperial City... from the beastfolk natives for the secret of literacy. Pretty soon, the beastfolk all knew how to read and write... which was handy, since it made them better slaves for the Ayleids, hahaha."